If you’ve done some research on the Shiba Inu breed, one thing you’ve certainly heard and read over and over is how hard they are to train. I’ve done my share of breed education, both online and at special events such as Pet Expo and Meet the Breeds, and, yes, I do tell people Shibas "can be difficult to train," "aren’t recommended for first time dog owners," are "too smart for traditional dog training methods," and that they "bore easily. "” All of this is true of most primitive breeds. Is Snick An Exception to the Rule? All of the above can be true of the Shiba Inu… But then people look at Snickers and what is he doing? He’s by my side, working the crowd, giving high fives, getting mobbed by children, having his ears pulled, speaking for treats, and merrily kissing faces. And what’s that hanging on his ID collar? A Delta Society Pet Partner ID tag! It’s true. Snickers is a certified good dog. He’s a doll. He seems to understand almost everything I say. We go on therapy visits together, mostly with children. He will sit, spin, speak, high five and give kisses on command to amuse kids. But, he also pulls on leash more often than not and can NOT be trusted off leash outside securely fenced areas. He’ll steal a treat bag, jump on the kitchen table, or rummage through the garbage in a heartbeat if he thinks for a second that I’m not watching. I take him with me when I go out for coffee and he sits at my feet while I read or work on my laptop. He adores most everyone who stops to say hello and most of them say what a well behaved dog he is. On the other hand, if he doesn’t like you, he’ll turn his back to you and no amount of my telling him “say hello” will make a difference. Nope, he’s no exception to the rule. He was a terror as a puppy and still tests my patience from time to time. So, how DO you train a Shiba Inu? Beyond those two important pointers, here are a few others that I think help with intelligent, independent breeds like Shibas. Mix it up. Don’t train repetitively. Work on one thing for a little while and then do something else. Don’t pattern train though! If you go in the same order all the time, that’s just as boring as doing the same thing over and over. Make it fun for both of you! If you’re enjoying yourself, your Shiba will be more likely enjoy it also. SOCIALIZE your Shiba well. No matter how much obedience training you do with your Shiba, if they aren’t well socialized, no one will ever know it but you. Check out Behavior Shaping which is a what "clicker training" is all about. This is absolutely the most fun way I’ve discovered to teach Snickers anything because it makes him THINK. We both enjoy it! In summary, "training" the independent, primitive breed dog is about communicating – forming a bond – and making it challenging, fun and worth the dog’s while (otherwise, he’ll find more fun things to do). And don’t forget the cheese! Feel free to share any training tips that have worked for you in the comments! Great article! Although, I have to somewhat disagree with saying Shibas are hard or difficult to train. I think it’s the owners that are difficult to train! I’ve learned from experience. Shibas are highly intelligent and do learn quickly. But, yes, they get bored quickly. That is why, in puppy class, I could get Sushi to perform perfectly 3 time in a row, while everyone else was struggling with their puppy. Even though, the trainer wanted us to continue until the next step, I would stop. It was obvious Sushi was thinking “why do I need to do this again, I just did it!”. I learned with Sushi, the key to teaching him anything, is to make it a big game. That involves cheese, of course, or a really stinky treat (Wellness Well Bites are a God send, unless I leave one in my pocket, pee-u!!). Lots and lots of silliness and praise, but he responds to it so well. Sushi is 7 yrs old, but I still teach him things. He is learning the “touch” command these days. I try to come up with different games to play with him, too. He enjoys it and so do I.
BTW – Snickers is an awesome role model! Awww, thank you. 🙂 Yes, you are right. “Can be difficult to train” really just means the traditional, repetitive training methods don’t work well. When I talk to people at events, I always go on to explain that once the PERSON learns how Shibas think/work/learn, then the training isn’t difficult… it’s fun! Touch is definitely fun and makes it easy to teach all sorts of other things. I’m currently “teaching Snickers to read” (for R.E.A.D.) and I taught him in about 60 seconds to point at the text in a book when I say “read the book.” I started by telling him to “touch,” rewarded him a few times and then changed the command. Easy! Snick is about to be 7 as well! I have been a dog person all my life. My first dog was when I was 3. As an adult, with the exception of when I was in the Army, I have always had a dog or dogs around me. Almost 12 years ago, after feeling sorry for myself having put down two old and faithful dogs, I discovered the Shiba online and became interested in the breed. As luck would have it, on a trip to the local shelter (the majority of my dogs over the year have been rescued) lo and behold there was a shiba cowering in the corner of one of the cages. He had been picked up after having been let out of a car (on purpose). I adopted him a week later and named him Jade. He was one at the time. He will be 12 1/2 in January. I have always been able to train my dogs and usually just keep to the necessary basics – stay, sit, come, etc. Jade, on the other hand, is the exception to the rule not that I haven’t tried. He has successfully mastered “stay” and that is about it. He even “failed” a short training session we had here in the adult park we live in. He socializes well as we have over 200 dogs in our park during season. Thankfully, we have a fenced dog park which is the envy of other parks in the area. He is beyond independent. He has never “come” unless a treat is involved. It is a chore to get him to go out for his business and then when we get him there, he doesn’t want to leave. I have had cats that haven’t been as stubborn as he is. I can see why it isn’t usually recommended that a shiba be your first dog. We think he had been abused as he has a fear of loud noises plus the fact that he had been abandoned on the freeway. But, at this point, there doesn’t seem there is much to do but love him and enjoy him for however long he has with us. I am DESPERATE to learn how to train Saki… my one 20 month old Shiba (female…. not spayed). Do you think spaying her will help with any of her aggression toward other dogs? she seems to especially hate shibas… haha. I totally agree that if they are not well socialized than all goes out the window (training) once you make that entrance to the park. I have several friends who are willing to have a doggy play date but im sure that Saki will ruin it the first second we are there. How can we work on, specifically, socializing her? please help! also, would obedience classes help at all since they follow the traditional guidelines? It isn’t guaranteed that spaying would help with her dog aggression, but anything that changes the hormones in the body could potentially change behavior. Unless you plan to breed her, you should plan to spay her anyway. The last thing you need is accidental puppies and all of the vet bills and worries that comes with that! Obedience classes (taught by a good trainer, using positive reinforcement NOT AVERSIVES) can be a fantastic help is socializing her if you take her regularly. It’s a great way to spend controlled time around other dogs while Saki learns to focus on you instead of being distracted by the other dogs. Once she learns to turn her attention to you even when other dogs are around, you’ll be on your way to having voice control in places like dog parks. The key for attending obedience classes is to find a trainer who understands dogs are individuals. Shibas bore easily. Too much repetition turns them off. When Snick and I were in training classes, I would do other things with him as other class members took their turns with whatever we were learning. Another good tip I’ve learned along the way is that walking dogs on leash together helps them get to know each other and learn to get along. Then you can turn them loose in neutral territory to get to know each other off leash. If you have friends with dogs that are good communicators and tend to get along with other dogs, try this with one of them, then another one, then a couple of them together, etc, until Saki is more comfortable with other dogs around. Socialization with other dogs takes patience, like I mentioned in another post, traveling the path to peace in the pack requires patience and baby steps. Please let me know how it goes with Saki! A great book to read that can help guide you to helping your pups become better social with other dogs is “Fight! : A Practical Guide to the Treatment of Dog-dog Aggression” by Jean Donaldson. It explains the whys and hows of dog-dog aggression and gives several methods to help modify her opinion of other dogs. Go to the dog park (without her) and make friends with people who have dogs with mellow and easy going personalities. Se if they will be willing to do a “walking date” to help your pups get better used to dogs. If you can’t get some dogs to work with, you can also see if there is a trainer that is willing to let you sit in a class with her and work on such techniques as mentioned here and in the book I mentioned. Take it slow and try not to get frustrated, things like this takes time. The best thing you can do now is controlled exposure and making sure every time is a positive experience for her. Make sure she doesn’t go beyond her threshold, when gets to the point where she doesn’t take treat call it a day. Let me preface this by saying, I am not a whiz bang trainer and my Shiba was the very first dog I ever owned, so we learned together through trial and error. The good part of never having a dog before was that I didn’t have any preformed ideas of how a dog should be. I also have owned cats all my life, so I was pretty familiar with the Shiba “‘tude.” Although, I will say that my cats are better trained than Tikka ever will be! I even tried to use my cats as an example to teach Tikka recall once. Tikka totally sabotaged that attempt by blocking the cats from coming to me, lol! Based on my own experience, the human needs to understand his/her own limitations first. One needs patience and humilty to train a Shiba. Two traits I am sorely lacking. One also needs to learn respect for intelligence and the will of another creature. Shibas are nothing if not willful. Once you understand yourself, then you can work to understand your Shiba, first to decide what is most important in training (e.g., simple obedience, CGC, agility, etc., and second to decide on the appropriate training methods that will make you both happy (puppy classes, personal trainer, clicker trainining, etc.). In my case, I decided on “survival training,” those things that I felt were required that would save my dog’s life and my sanity. Sit, down, stay. I taught her not to rush the door. I taught her “easy” for when she is around children and smaller dogs that would not appreciate her prey drive. I didn’t teach her not to pull on the leash, I just bought a harness with the clip at her chest that made it impossible to pull. She taught herself on that one. I agree with everything Jenna has said about training, especially about avoiding aversive methods. In puppy class, the trainer would “pop” Tikka’s leash when she was ignoring him. That just made her even less willing to trust the trainer or do what he wanted. She would simply turn her head away and he would disappear from her world. With everyone looking on, this humiliated the trainer and after the third class, he asked us to leave and get an individual trainer. Thanks for the input on your different expirences, my wife and i just took Bruiser (8 week old male shiba) home a few days ago and he is something else. I can see the stubbornness in him when we leash him to go outside. Just a question, i feel like when we go outside to pee, he takes it as play time and is very distracted and doesnt pee even if we are outside for about 30 minutes. I give the command go pee and he decides to gets his head stuck in fence, chew on trees, everything but pee. He has basically slept threw the night since the second day home. I am just wondering if their is anything i can do to break this habit, or will he just go when he needs to go? I can say he might have a little more energy during the morning times due to just waking up and not having play time yet. Any advice or insight would be greatly helpful thanks! It’s more than likely that your boy will pee when he needs to and, if you spend enough time outdoors with him, he’ll have plenty of opportunity to do so. It sounds like he already knows not to pee indoors and he doesn’t need to go during the night, so that’s great! On the other hand, I realize that sometimes you’re in a hurry and you really do need them to get it over with for whatever reason. Work on assigning a couple places as “pee spots” where he’ll automatically go. Take him to one of those places when you KNOW he needs to go and don’t leave that spot until he goes. No playtime or running around until he pees. Then, when he does pee, reward him with treats and lots of playtime. If he is food motivated, a treat after he pees or poops outside will help him learn really quickly that that is what you want. I have a 7 month old Shiba called Navajo who is adorable, of course, but naughty too and bitey. She’s more or less finished with the teething which we hoped would stop her chewing everything in sight including us, but she’s still at it. She seems to start biting and then gets into a frenzy and won’t stop until I put her in her crate. Is there any advice you might have to try and stop her biting. I’ve tried substituting my feet, toes, arms, hands with her chew toys but this doesn’t seem to work. She’s fine when not in biting mood and everyone tells us that it will stop – but when and is there any advice you can offer. I’m also trying to train her in the park – and as everyone says here she gets distracted by anything and everything and I don’t feel i could let her off lead for even a few seconds. Thanks. I’m so sorry… I must have missed the notification for your comment. I just read this today. The situation with your pup has probably changed some in the weeks since you commented here. I hope the changes have been for the better!! My first and foremost advice would be… MORE EXERCISE!!! A tired Shiba is a good Shiba and they especially need a lot of exercise at that age. When Snick was young, we spent an average of three hours a day outside. If we didn’t, he was bouncing off the walls (when he wasn’t chewing holes in them) and he didn’t listen to much of anything. Regarding all the distractions of training in the park, I recommend that you start somewhere with NO distractions and work your way up. When you are training somewhere with distractions, do it after a nice long walk… remember, a tired Shiba is a good Shiba!! Honestly, though, regarding the off leash work, I don’t do that anywhere. It just isn’t worth the risk. I use training leads (30 feet is great). The dogs can drag them around and move as if they aren’t leashed, but I have the security of knowing I can catch them if they take off. Hi there well I am new dog trianier. I have gotten my certifcation through Animal Behavoiral College. I have recently have a new client that has 7 month Shiba Inu. I am doing private lessons with this dog. Kieko is his name. He is very scared. He peed rate as I was approaching him. He hide behind the owner, I have explain to her dont let him do. I also explained to her when he is scared of someone new dont react. She tend to praise him when he is been submissive-fearful. When I believe tell him that is okay to act like this when a stranger comes. I so happy that I read Cheese. Cuz that is the only treat that I could get his attetion. She wants me to be able to treat him all the basics he already knows sit. So I am trying to teach him come. But I feels its impossibale. He is finally warming up to me after hour session with him. I did get a trail wag good bye. So I am wondering if you could give me any pionts. She had said he is socizaled which I dont really believe he is. He does love love other dogs. And acts totally different when he is with other dogs. But he scared of wrappers wind and every and anything. I know some of it is the breed any suggestions. Thanks you so much!!! Hi Holly. Shibas are not usually so afraid and skittish. Part of the Shiba personality is a spirited boldness. They usually have strong personalities and very little fear. Sounds like this boy didn’t get fully socialized with his mom and litter before being separated. Was he a pet store pup? 🙁 He CAN potentially overcome his fears. He’ll need a lot of socialization and support. At 7 months of age though, he could still be at the end of his second fear period. I wouldn’t push him or expose him to anything new and scary for a few more weeks when he’ll likely be more confident. Then, using distractions (and CHEESE) when he is near something scary will help him. Also, letting strangers (obviously, strangers to him, but not to you) give him cheese and praise when he’s calm will help enormously. Here’s a post I wrote about teaching Shibas to come when called, which may help you out. His owner is going to need to work on this with him every day of his life though, so make sure you are training HER as well as training Kieko. Hi, I read the tips for training recall. My shiba (Akira) is nearly 18 months and up to around 3 months ago we had trained a really strong recall, the emergency recall and the usual recall. However, in the past few months she has decided not to come after all – is she testing the boundaries (adolescent years?) and she’s also ignoring the cheese – which she bounded over for before. Does this mean I should upgrade treats? Thanks! Hi Jessica. You don’t necessarily need to upgrade the treats. That could get you stuck in a cycle of constantly having to upgrade to renew the behavior. At some point, you run out of upgrades! I have a question. We just got a 6 week old shiba puppy this past weekend. He cries and barks every time he wants to go potty, and we rush him outside. It’s fantastic. He basically self potty trained. We’ve only had 1 accident in the house so far, which I think is great. The only problem we are having is that he needs to potty 2-4 times every night. So we get up and take him out in the freezing cold so he can pee. Is it better to keep getting up every time he needs to pee, or is it better to put a puppy pad in his bed so that he can pee on that? I was worried using a puppy pad might be taking a step backwards. Also every time we leave him in the kennel he screams and screams. He screamed for 2 hours last night. I keep caving and letting him sleep in a blanket filled laundry basket next to our bed. I hate to let him cry like that, but I also don’t want to teach him that if he cries then I’ll cave and give him what he wants. Not sure the best way to potty train a dog that already knows it’s supposed to go outside but has a tiny baby bladder. Hi Kim, six weeks is really younger than a puppy should be separated from his mother and litter mates. You’re not going to be spoiling him by “caving” and letting him sleep in your room at night. Honestly, in my opinion, for him to grow up well-adjusted you SHOULD let him sleep near you. He’s too young to have to learn to be alone for such long periods of time. You can teach him that later when he’s old enough to handle it. In a few weeks (pups mature quickly), when he’s more able to handle it and more confident about his new home, you can start leaving him in the crate for short periods of time (preferably around nap time). Gradually increase the time he spends in his crate and he’ll get used to it. Give him a treat when you put him in there as well, so something good always happens when he goes in the crate! Re: paper training and going outdoors, when I brought Snick home from his breeder he was 9 weeks old. It was a really bad winter and there was a snowstorm shortly after we got him. It was honestly TOO cold for potty training on the icy sidewalks of NYC, so I broke down used puppy pads for about a month. When the weather got better, it was very easy to transition him to going outside instead of on the paper. I left the paper down for him for awhile, just in case, but as soon as I started taking him outside often enough, he stopped using the paper on his own. This is an excellent article on crate training from the ASPCA. Hi there. I have a shiba named Noah. He’s quite the character. He is very independent and I find that difficult when I try to play with him. What are some good games to tire him out so we can both enjoy ourselves? Marissa, my suggestion would be tricks training. Take long walks together – Shibas love to explore the world – and then make a game out of teaching him tricks. Walks exercise and tire the body so he’s more able to pay attention to you. Learning tricks exercises the mind and strengthens the bond between you as you accomplish shared goals. Marissa, We love playing hid and seek you will need an assistant however for this game. First have your assistant take your dog in another room and then you hide in plain sight an call the dog your friend gives the command seek. Give the dog a treat for finding you. Then try it again but if you had been in the dining room for instance this time you would move to the kitchen, After a few times your dog will actually start searching for you when you play and you can make it more and more difficult to find you, Our Shibas love this game and are very good at it. We find that it is good for the mind and body. That sounds like fun! Thanks for the suggestion. I have to try that with my dogs. You could also combine that with teaching “stay.” For example, I could play this game with Snickers without a partner, because he will sit/stay or down/stay while I leave the room. Using a partner to keep a dog that doesn’t know “stay” in place while you hide would help them learn what “stay” means. I have a 7month old shiba named Keira. At home she does anything I ask. At school or anywhere outside her yard, I can’t even get her to look at me. I’ve tried every possible yummy treat. ( on or not on an empty stomach) and yet I haven’t found any reinforcer that is more rewarding than what she can smell or see out doors. We’ve tried toys also, nothing! I don’t expect to have a her doing tricks and I wouldn’t even care if she didn’t get past class one. However, my inability to get her attention is proving to be dangerous. Near main roads etc. I would never let her off leash but to have her sit or slow down or even just to look at me before crossing a road or approaching ( heeling would be ideal but even a look I’d settle for) would make me feel far more confident. I’ve asked trainers and they tell me to find a better treat or toy ( have tried to no avail ) and the idea of getting her to walk loosely on a Leash by stopping every time she pulls has not been successful either, in fact she is rewarded by being able to sniff the ground we stop on. Any advice would be fantastic. Very glad I found this website. Hi L’shae, how is it going with Kiera? Maybe the best defense against this problem is to desensitize her to the distractions by spending lots and lots and LOTS of time outdoors! The more time she spends outside, the less “shiny and new” it will all seem. I also suggest that on each venture outside, you give her plenty of time to explore and play and just be a dog before asking her to pay attention and do any training. Then mix it up – give her play time, stop for a bit of training, more exploring, more training, etc. As for the loose leash walking, maybe you can practice that somewhere that is totally boring? Like back and forth on the same stretch of sidewalk or road or hallway? Time will help as well… as she matures, it will be easier for her to focus. Hi Jenna, thank you very much for your reply. I ended up seeing an animal behaviourist. A few things she told me. Change from collar to a walking harness, the pulling on collars makes our furbabies more aroused? And this one killed me the most: make Keira work for all treats, no special hand outs ( I love going to the store and getting her a chew or something special) no more food in her bowl, have a kong wobbler handy and feed her when she pays attention to me. So the lead has worked wonders, I can get a sit now at a crossing after about 2minutes. ( she lets out a frustrated cry and then sits) and walking is far more enjoyable!! I’m still giving Keira special treats but am trying to cut down. Im just happy about our progress! It’s shedding season for her at the moment, the furballs are flying! That’s GREAT. I’m so glad you and Kiera are making progress! They all do. That’s the REAL trick to training a Shiba – you don’t. They train you and you THINK you’ve trained them. That was such a fun day though. I guess they trained us really well, because, not only did we TAKE them, but we ENJOYED it too! Snick, we both know, you trained your mum! iz so true Mali Ki. iz so true!!! Hi, I have been thinking about getting a shiba for months now and I even found a breeder to buy from, but after reading all these stories it makes me a little nervous. I’ve owned other dogs before and never had too many problems with training, but every time I start to feel confident about owning one I read another story about how hard they are to train. It makes me worry that I can’t do it. Do you have any advice for me or training tips that will make socializing and training easier? And what is the best way to potty train a puppy? Also how do you get them to sleep through the night? Sorry for so many questions. Hi Whitney! Don’t be sorry about so many questions. It’s great to ask questions and be prepared before you get your puppy! As far as general advice and training tips other than what is in the post and comments above, I highly recommend (1) reading the book Bones Would Rain from the Sky: Deepening Our Relationships with Dogs by Suzanne Clothier and (2) joining the Shiba Inu Forum. For socializing, my best is advice is do it, do it, do it and then do it some more! I was lucky… Snickers spent the first five years of his life living just off Times Square in NYC. Every walk was an adventure in socialization. I even let the homeless people pet him when they asked. The result? Absolutely NOTHING phases Snickers (except houseflies, but that’s a different story)! For potty training, if you crate train (WHICH I ABSOLUTELY RECOMMEND) Shibas practically house train themselves. Lastly, sleeping through the night takes a little adjustment time. Snickers came home at 9 weeks. I lived in a NYC apartment, so letting him “cry it out” was not an option. (I don’t really like that philosophy anyway.) My daughter and I took turns sleeping in the floor by his crate for the first week or so. During that time, we established a strict routine. I said the exact same words in the exact same way when I put him in his crate each night. I gave him the same treat. I covered the crate with a dark sheet and then one of us slept next to him with our fingers sticking through the crate so he knew we were there. We didn’t talk to him if he cried, but we did wiggle our fingers to remind him we were there. After about a week, we did everything EXACTLY the same, EXCEPT no fingers in the crate. After a few more days, we did everything EXACTLY the same, EXCEPT we didn’t sleep on the floor. (His crate was near my bed, so he could still hear me breathing.) That was it. He learned we were going to be there all night – that he wasn’t alone – but he got no reinforcement or encouragement to make a fuss, so he learned to sleep through the night. On Socializing I completely agree with Jenna. I tell my puppy buyers and anyone else getting a shiba that socializing is a lifelong commitment when you have a shiba in your life. I say that they should meet 1 new person a day until age 6 months and then one per week for the rest of their life. I also say that when their puppy is 6 months old and cannot possibly be more social that they socialize xome more and when the are 2 and totally socialized yep you guessed it socialize some more. I have 4 year old dogs who are super social and we still take them out sometimes just for socialization. We have been known to go to Casinos(we live in Reno) and walk the dogs on the gaming floor to meet people. You should be able to get an idea of what your dog will be like by observing the parents of the pup. The mother should be onsite. House training a shiba is the easiest thing you will ever do. Since they are very clean they figure out right away that those things need to be done outside. Most Shiba puppies if properly raised will be well on their way to being house trained when they go home at 8 weeks of age. Talk to your breeder about if house training is started. At 8 weeks it has been my experience that they need to go out every 90 minutes or so….set a timer. Give a treat as soon as they do their business outside. Stalk that puppy and help it be successful. As for training behaviors you need to make it fun so that the Shiba thinks that doing the behavior is his or her idea. Have fun with your new friend. Thank you both for the great advice! I guess I’ll just have to hat with my breeder some more. 🙂 thank you! All this training!!!! I have been looking for a Shiba and we just got Apollo 24 Dec. He is every thing you could ever ask for, If you love life! Shibas do smile, it will take 2 hours to catch them if they get off the leash, and they have a truly defined personality. LOL as I speak my seven month old just stood beside me and peed. Apollo has 5000 sounds just isn’t good and barking to go out. Just got a male 8-week pup n have had him for 2-weeks.his name is kuro bushi.most of all “we” are going great. He is potty trainned for the most part(only cause im all over him…i live in apartment so he goes out when I say ,which is after every nap or comimg out of his crate) we spend a lot of time outside playing. and I just let him explore his new space.. he does a little bit of (play)Hand biting which we are working on. sometimes he throws a major fit when it’s time to go inside or if I have to redirect his behaviors, but I just try to keep my energy calm, swoop him up hold him tight and calm. he usually will settle himself down. he brings me such joy and he is a constant attention hog which I’m glad to give him. however when he’s done with me he just turned his back toward me and does his own thing. I’m so glad I found this forum. the information and the support is so beneficial. thanks for all the advice comments and positive affirmations to my new little shiba inu. My boyfriend and I recently got a shiba and she has been very troublesome. She is 5 months and healthy. We’ve had her for about a month now and she has ran off 5 times already. we don’t understand why she keeps running. we give her lots of attention and all the room she needs. she is very friendly and loves to play with other people and other dogs. she loves to explore but then cannot find herself back home. we are having a hard time training her. so far she knows how to sit, but doesn’t know when to sit when we tell her. she doesn’t respond to her name all the time. maybe 1/3 times she will look back. but its been very difficult for us. its hard to get her socialized because we can’t take her out yet due to not having all her shots. having the responsibility to keep her on a leash at all times is making her more likely to run again but we cannot risk getting another ticket for her running away. can you offer some help or advice? we’ve read almost everything we could about training her and understanding her behavior but it’s simply not enough. we were actually thinking of selling her if we can’t train her. it breaks our heart that she does not want us. 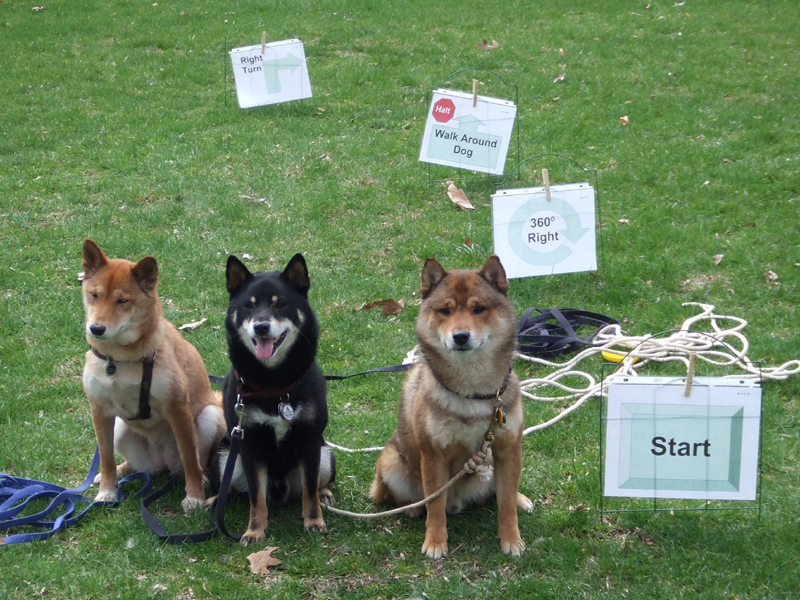 A Shiba Inu – especially a puppy – should be kept leashed or inside a securely fenced area whenever they are outside. They have a very high prey drive and can’t be trusted to stay close to home. Your pup could chase a squirrel (or a paper bag, lol) and be so far from home by the time she stopped running, that she wouldn’t be able to find her way home before getting hit by a car or taken home by a stranger. I’m not sure why you think keeping her on a leash would make her more likely to run. Keeping her on a leash is the responsible way to keep her safe. You keep her from running by (1) giving her plenty of mental and physical exercise and (2) not giving her the opportunity to run. Also, her wanting to explore and chase after prey has nothing to do with whether she wants you. It’s in her nature to do those things. Part of being a successful Shiba-owned person is making time to do those things with your Shiba. When Snick was younger, we spent an AVERAGE of three hours a day outside together. In the mornings, he spent well over an hour playing with his friends at the dog park. In the evenings, we went on what I called “adventure walks,” because it was his time to follow his nose and explore (with me on the other end of the leash, of course). Now, at 9 years old, I do actually trust him off leash in many circumstances, but I wouldn’t test that theory anywhere that I thought he might be tempted to chase something! At five months old, if she’s up to date on her shots, there’s no reason why you can’t start taking her to socialize with other dogs and people. I HIGHLY RECOMMEND puppy kindergarten and/or beginning obedience classes. Training together is a great bonding experience. Bonding is everything. Off Leash…….the section in the Shiba Inu book of training pertaining to off leash training is short and simple it says, DONT. Training…….I highly suggest puppy kindergarten classes, you can find these classes most anywhere but do look for one with positive training methods. The classes teach you how to train your shiba. This will not only take the class time but likely you can be successful if you practice what you are learning in class at least 4 times per day for 10 minutes or so. If you do not have a fenced yard and are not willing to keep the dog on a leash when you are walking etc then it is in the best interest of the dog to rehome her. But if you decide to go that route please assure her safety by only letting her go to someone who knows the breed well enough to keep her safe. A little story………A friend of mine who has been a breeder of the Shiba for over 20 years sold a shiba puppy to someone who lived on the edge of town and behind their home was desert. The husband took the dog running in the desert every day for 2 1/2 years the shiba stayed within close range with the owner ever day until………..one day he just disappeared. I figure there are 3 scenarios which could have happened to this dog. 1. someone found him and kept him in a yard and on a leash. 2. He was eaten by a coyote 3. he perished of starvation and dehydration in the desert. If only this mans ego did not make him put his dogs life in peril. Another story……Same friend sells a dog to some people who live at Tahoe. They were at the lake and the dog had always stayed with them, they were having a great day at the beach and playing fetch. The dog ran just up into the treeline to do her business, then darted onto the highway and was killed by an oncoming car. Something as simple as a leash could have kept her safe and it does not matter to me if the dog is a shiba or not any dog can take off after a squirrel and be killed if not kept on a leash. MY SHEBA IS SO FEARFUL OF THE RAIN, SHE HAS RIPPED THRU SCREENS & DOORS. WHAT DO YOU THINK WILL HELP HIM? I’m not sure that I understand… she is ripping through doors and screens to get outside to the rain that she’s afraid of? Is it just rain or is it the thunder that comes along with some rain? Have you tried giving her Rescue Remedy to calm her anxiousness? Or maybe a Thundershirt would help. One of mine is terrified of thunder and fireworks. Rescue Remedy upsets her stomach so I eventually tried Diazepam (an Rx from the vet) and that has worked wonders. It actually seems to be desensitizing her a bit and she’s less scared during storms even if I don’t give her any. I do make a point to turn on the TV and/or music and do other things to keep her distracted whenever there is a really bad storm. If I’m misunderstanding and what you’re saying is that your dog is ripping down doors to get into the house when it rains, then all I can say is let her inside and you won’t have a problem! My roommates dog is awful. We all hate him. He’s so cute but he bites our calves everytime we walk in the room. If we bop him on the nose he attacks us. We’re not sure what to do. Any helpful hints? Second, a question – it sounds like he’s trying to play with you. How old is he and how much exercise does he get? I have a Shiba Inu and he is 20 months old. He is a great dog with us and was easy to house break. I can pull his ears, pull his tail, take his treats from his mouth, put my face in his dog bowl while he is eating and he won’t do a thing. He is a great watch dog as well and is fun and playful! He has a strong bond with both my husband and I and we love him very much. We got him when he was 8 weeks old and we took him to pet school and socialized him as well. We also are having people over our house so he has been around a lot of people and did fine. But just in May he started to become aggressive toward people. He was with my parents the first time it happened while they were watching him. They had a friend over and he went to pet him and he growled and nipped him. They told us but we were like how could that happen he is always fine around people. Then one of my friends watched him for a couple days at our house and she said that he would growl and show his teeth at different times. Once again we had never seen him do this when we were around. In about September he did it twice when we were around, he growled and barked in an aggressive way toward our friends. But the other night while walking him, a stranger came right up to him (didn’t even ask me, and I didn’t have time to think not knowing anything would happen), and pet him and he growled and bit her. Thankfully the bite wasn’t to bad. The next day though we had friends over and he met them and was fine but then a little later my friend went to pet him and he growled and went to bite her and I grabbed before he could. I do not know why he is doing this and I really want to get help. Any advice? Should I get a personal trainer? I do not just want to put him away when people come over because I know it will only make matters worse. We do not have kids yet and would like to start a family soon so I know I want to get help for him and even us to know what maybe we are doing wrong in training him. It’s impossible to know for sure without actually observing him, but my guess, from what you’ve said, is that he’s overwhelmed and feels like he needs to protect himself. (Keep in mind, it’s what your pup perceives as scary that matters – not your perception of what he should or shouldn’t be scared of.) Even the best socialized dog can have fears and insecurities. It sounds like your pup is feeling insecure about having people in his space, and he may even unsure about exactly defines his space and who “has his back.” All of the incidents that you mentioned happened when he was in someone else’s home or care or when strangers were in his home or approaching him. When your pup is meeting new people (or greeting people he doesn’t see often), don’t thrust him into the situation or let people come up to him uninvited. If possible, ask people to get on his level – to sit or kneel on the floor – and let him approach them to say hello. Make sure your dog knows that he doesn’t have to “be social” if he doesn’t want to. Most importantly, make sure he knows that YOU are his protector, so he knows that he doesn’t have to protect himself (by growling or nipping to scare people away). When anyone else is going to be caring for him – either in your home or theirs – ask them to do these things as well. Even though it sounds like you took all the right steps to socialize your dog, that doesn’t necessarily mean that he’s confident in any situation with all people. Not all dogs (not even all Shibas) are that bold. Some are nervous about new people and they need to be reminded that they don’t have to protect themselves – that you’ll do it for them. I hope this helps. Feel free to write back to let me know how it goes! A Shiba was my first dog and a huge challenge! But I could have her off leash by the age of 2 and this is what worked. I worked with her prey drive and proved to her that I could find squirrels, gophers or mice too. Then I would signal that I spotted something and she’d come. That was the reward for returning to me. Then as we bonded I would give her her freedom and when I wanted her to come back to me a good ole holler from the depts of my gut and she would come! But I did have to mean it! I am thinking of adopting a rescue shiba but I am on the fence. This is a 5 year old little girl, she is very sweet, loves people and is currently in rescue and they are on the fence if she is a foster fail. Would love to chat if you had a few minutes! Awww, yay! Hit me up on facebook and we’ll talk. My wife and I just bought a Shiba, at 8 weeks of age last Saturday. We did all the research before making the decision to bring home little Chumli. So far, he has been wonderful in all areas except for one. He has shown aggressive characteristics towards other dogs. He was the only puppy in his litter which may be the issue (I’m not really sure how this will effect him). I understand that the most important thing we can do is socialize him. But we are nervous because every time he has gotten around another dog (3X since this last Saturday) he has growled. The last time he freaked out. It didn’t seem like normal puppy behavior. We will be signing up for puppy classes as soon as we are able to (once all his vaccines are done). We also are trying to take him everywhere with us. Do you foresee this being a problem? Obviously, we love the guy and will do whatever it takes. But any information this early on will be super helpful. Thanks! Hi there Jenna! Thank you for this website. I will be picking up my Shiba in march once she is 8 weeks. prior to choosing an Shiba I read they are stubborn and difficult to train (I have also read this ENTIRE BLOG it seems like) Now, I am a little nervous. Please tell me that besides the difficulty training, the biting, the possible social problems etc. that my puppy will love me! My husband works three times a week and I work 5. I am really nervous about her baby years with no one home for 8 hours, 3x a week. We will have to use a crate during that time. Do you have any advice on how to make that situation the best possible? Unfortunately, neither of us would be able to come home during lunch to let her out or play. I am a teacher so she will be in that situation for her first three months before I will be home for the summer. I plan to spend extra time outside in the morning and after work to get in her needed exercise. We live in an apartment, as well. We have a screened in porch. Could it possibly be better to put her crate out there for fresh air or is it better inside? I truly appreciate your blog and all these comments, I already feel better prepared for our new baby. Hi Annie! Oh, yes, she will love you. Shibas are fiercely loyal dogs! My best advice is to spend A LOT of time outside exercising her before you leave for the day. Kongs can also work wonders. I wouldn’t do this until she’s house trained and can wait awhile after eating to go outside, but after that a tightly packed Kong (kibble, cheese, peanut butter, treat, etc.) can keep a dog busy and happy for a while. Eight hours is a long time for her to be crated while she is so young. If you can’t get home to her, can you use a dog walker? It will make crate/house training go much more smoothly if she gets the chance to go outside halfway through the day for the first month or so. Personally, I would NOT leave her crate outside on the screened-in porch. I keep my Shibas under lock and key. betilu, it’s great to hear that things are going well with kuro! If possible I would sign you new puppy up for doggie daycare for the days that you will both be at work. 8 week old shiba puppies need to eliminate every 2 hours. The rule of thumb is they can go one hour for each month old they are. My personal feeling is that no dog should have to wait more than 4 or 5 hours, I know I would not like it if I could not get to a bathroom because I could not open a door and get out. The doggie daycare will also help greatly with socialization. The pups come home tired and socialized what could be better? On the porch note I know I certainly would not try that the possibilities of a vanishing shiba or changing weather are too great not to mention the screaming that will go on if indeed you do crate the puppy for 8 hours and she needs to pee you will have the whole neighborhood on your case and not just those in your building. I do hope for the wellbeing of your puppy and your own sanity you will consider another option if possible. Cheryl, congratulations on your new family member! It’s hard to give you any specific advice without knowing any details about her, but check out the Shiba Inu Forum. It’s a great community full of Shiba owners willing to give advice, listen, etc. Thank you all for the advice. I loved the idea of a doggy day care while we are at work. Sadly, the puppy we were going to get passed away last night. The breeder had no control over the sad situation. The news truly has broken my heart. I look forward to the day we get to add a shiba to our family. Annie, so sorry for the loss of your potential puppy. What happened? My Shiba is 11 months old and has been an absolute angel. To be honest, I was very anxious when I first brought her home after reading all the information blogs out there about how ‘difficult’ and ‘hard-to-train’ the breed is. I guess we have just been exceptionally lucky to land her with her wonderfully sweet and docile temperament and outgoing personality. Hi Victor!! If you read this article, all the great comments, and the various articles linked from the article and from the comments, you have a decent head start. My other advice would be to join the Shiba Inu Forum. That’s a great group of Shiba owners, plus the really experienced people there are happy to give advice to new owners! This article is really fantastic!I just recently got a 13 week old Shiba and he seems to be not so much like what I’ve read on the breed before getting him. I think it might be because he was neutered at only 6 weeks! Which broke my heart when I heard about it. He’s not very playful though, he’ll have random play spurts and I work at a dog daycare so he comes with me (he can be fresh at times certainly) but all in all he doesnt really like playing that much. He never screams or barks. It’s just making me a little nervous that maybe he will start misbehaving soon? Have you heard of this before? He sleeps in my room with me and we do not use a crate for him, we put him in a playpen when we’re not home. Are we doing something wrong? He’s oddly calm all the time. And he’s clear of every sickness possible! Any ideas? It’s entirely possible that you just got lucky and got an easygoing Shiba. It can happen! Don’t be surprised if he DOES go through periods of “misbehavior” though, although it won’t really be misbehavior. He will go through different stages of development, and he’ll behave differently during some of them. Check out this list and also this article. I need help! I adopted a 5 YO male shiba from a rescue 2 weeks ago and am overwhelmed by some of his behaviors. I had a shiba/chow mix before so I am familiar with the breed and temperament but Piper is so different from my mix. It is like having a 5 year old puppy. He requires constant supervision. I work out of my home so I am here most of the time. If left alone for a minute he will chew up whatever is in his reach. When he plays he gets excited and either humps whatever part of my body he can reach, nips at me, or bites my clothing. We are enrolled in a training class that uses positive reinforcement methods but rewarding him for the good things he does in no way prevents all the “bad” things. I am walking him at least twice a day and play fetch as often as possible until it escalates into one of the above behaviors. I am so frustrated! I am a dog lover from way back and have always gravitated towards the challenging and harder to adopt dogs but I’m just not sure about this. There are many other behaviors that also need addressing but these are the most pressing. Any help you can give me will be greatly appreciated. Thanks in advance. It definitely sounds like you adopted a handful! My first suggestion is to crate him when you aren’t able to supervise him. It’s been almost 3 years since I adopted my youngest, Zuki, from a shelter and she’s only JUST earned my trust to be loose and upsupervised for any length of time. Sometimes it takes a long while of you showing them what is OK and what isn’t before you can trust they will “follow the rules” when you aren’t there. If you do those things consistently and continue to the obedience training and bonding, you should hopefully start to see a difference. I was here 8 months ago and I wanted to share some positive feedback. I’d always hear about the behavior problems so I hope to share my story to motivate others. When we got our Shiba, we were very happy. She was great at first but then we began to see her behaviors and attitude. We were having a difficult time training her and eventually sought out help. After posting our cries to this forum, we were in touch with an experienced shiba trainer. We enrolled in puppy training then dropped out. We then enrolled in an adult 1 training and graduated successfully. We learned a lot about ourselves and our shiba. We were trying to make a shiba into what we want, which is terrible. We made adjustments around her and that eventually turned things around. Let me list some of the things we were struggling with from when we first got her. Over time, we overcame a lot of these things. 7. She was very pick but we had to make her understand that food is food. If she did not eat, we put it away and only hand feed her. Eventually she starved and agreed to eat whatever food we handed to her. We never feed her solid food out of a bowl. Only water. 9. She does not bite now that we understand why she guards her food. We work with that and make sure to think twice before trying to take her food away. If we want to take something away from her, we exchange it for a small treat. The biggest problem we had was her bolting through doors and recall. We have gotten into lots of trouble with her bolting that now we are extremely careful. We got her at 5 months and now she is a year old. She has improved so much because we took the time and patience to train her, spend outdoor time with her and keep her busy. We are very careful when opening doors, we practice waiting at the door every time and all the time. She is getting better at waiting for our signal before going through the door. She has shown us love and wants to be next to us on the couch now. It really takes a lot of time and patience with this breed. My opinion is that if you can understand your dog, you can really learn how to adjust yourself to make everything work. It goes both ways. It’s been a tough road and it is starting to pay off because we can see results. My shiba, Hachi, 4 months old. Cute, beautiful but stubborn. He was doing great before I brought Bimmer, half husky half samoyed, to my apartment. They barked at each other and chased each other. He and Bimmer lived in a huge cage together cuz they are still not perfectly trained. I can’t let them out or poops might be all over my floor. Recently, Hachi is getting very noisy. Is there any way to keep him quiet and get along well with younger Bimmer? (1) Lots and LOTS and LOTS of exercise for the body and obedience training for the brain. (2) You really can’t expect two puppies to be quiet, but keeping them busy and entertained will certainly help. Unrelated to your question, but… make sure you spend plenty of quality time with each of them separately. Raising two puppies at the same time is tricky. If you aren’t diligent, you will end up with them being more bonded to each other and not so much to you. We have a 13 week old Shiba who we’ve just started in a training class. She is our first Shiba and we love her. Prior to this we taught her to sit, stay, come and she is actually doing pretty well. Where we are struggling is on the leash and walking. She does not want to go where we want to go. She pulls ahead, to the side or lags behind. I was wondering three things…what type of collar ( standard clip, harness, pinch, etc.) is good for walking and what type of collar is good for training. Any tips to stop her from pulling and get her to walk with us? Thanks very much! I strongly prefer martingale collars for Shibas, as they are the only thing (collar or harness) that I’ve found that none of mine can escape. I would never, ever, ever use or recommend and choke or pinch collar for a Shiba. 99.9% of people who use them – including many trainers – don’t use them correctly. You could very easily do irreparable damage to your relationship with your dog. For leash training purposes, I’ve had good luck with the Easy Walk front clip harness. You have to use it as a training tool though – not a crutch that becomes a lifetime necessity. Snickers pulled very badly when he was younger, and I tried EVERYTHING. What finally worked with him was standing completely still when he pulled – not walking at all until there was slack in the leash and then only walking until he pulled. It was very frustrating and upsetting because sometimes our walks ended up being half a block instead of our usual 1 or 2 miles. It took persistence, but it worked. Read my reply to Kelly and Jojo about training for pulling. I trained Snickers in New York City and had the same problem. He always wanted to charge ahead into crowds, into traffic, around corners into the unknown, etc etc. It took a lot of patience and persistence to teach him not to pull. I sometimes used a no-pull harness as a training tool in addition to the not-walking-while-pulling method. I would use it when I knew we’d be walking in crowds (daytime), but I tried not to depend on it all the time. When he got older, I got lazy about letting him pull. He started doing it again, and I had to resort to the harness and the old training methods again. It is a lifetime struggle with some Shibas! PS Snickers is a Canine Good Citizen and a Pet Partners registered therapy dog. He has passed two levels of obedience classes, two levels of Agility training, and a “tricks” class. He’s a “good dog” in almost every sense BUT (1) he begs and (2) he pulls. He’s 10 years old now and one thing I have learned for sure is that when I am consistent and unyielding in my expectations, he’s much more well behaved. When I get lazy and inconsistent, he takes advantage and misbehaves. Annie, I’m so sorry that it took me so long to respond to your comment! Not only did a housetrain Snick in a fifth floor NYC walkup apt, but it was the dead of winter with snow and ice on the ground! I had the same problem with noise bothering my neighbors as well, so I can sympathize with what you’re dealing with. One thing to remember is that, on average, a puppy can usually hold it for as many hours as they are months in age (plus or minus an hour, depending on the dog). Your Shiba is about 11 weeks old now, so 3 to 4 hours is really all you should expect her to be able to reasonable wait without needing to pee again. When I had to go to work, I left Snickers in a small enclosed area (with nothing he could chew or destroy – except the walls, which he did) and left him a “pee pad” to go on when I wasn’t home. It was hard at all to transition him from using that to only going outside, as soon as he was old enough to wait till I got home. When I was home, I took him out every few hours (even in the middle of the night). He slept in his crate at night for the first few months. When I took him outside, I would just put him right back in the crate when we came in (with a treat for being a good boy) and tell him goodnight again. He was pretty good, although I will admit that for the first few weeks, my daughter and I took turns sleeping in the floor next to his crate so he wouldn’t cry. Also, when you can’t be home with her, make sure you give her things to do to keep her busy – a kong full of treats, cheese, and peanut butter can keep her busy for a long while! I hope the information on this page was useful to you. If you came here searching for tips on how to train your Shiba Inu, these posts may also help. Tips on Training Shiba Recall aka How to get that crazy dog to come when called!